It’s time for another week of Finding Finnick Odair! Each week we will be discussing a new actor and the pro’s and con’s as to why he should be Finnick. As always, remember that this is just the fan picks for Finnick. As far as we know casting for Catching Fire hasn’t begun yet. 25 year old Hunter Parrish is probably best known for his role in Weeds, but he’s also been in films such as 17 Again and Its Complicated. Hunter is also an accomplished stage actor, showcasing his talents before a live audience, appearing in both Godspell and Spring Awakening. His talents don’t end there, as Parrish is also musically inclined as well, and just recently released the lead single, Sitting at Home off his EP Guessing Games. One other thing to note, about Hunter…he was a fan favorite and finalist for the role of Peeta in The Hunger Games. We aren’t sure how he ranked at the end, but we do know he went in for a test opposite Jennifer and that he was in the final group of contenders. But is this charismatic, multi-talented actor, and almost Peeta a fit for the coveted role of Finnick Odair? Read on to find out what many of the Hunger Games fan sites think. Way back when everyone was fancasting for Peeta, DWTC was 100% behind the idea of Hunter Parrish for the role. When we learned he was in the “final” group testing to become our favorite baker, we were giddy to say the least. And when Josh was officially named as our Peeta, we can’t say we weren’t more than a tad bit disappointed at first. However, some of us shortly after started to picture him as a possible Finnick, so we could totally get behind the idea of him stepping into the role. So, why could we see him as the famous Finnick Odair? Well, he loves the books first and foremost, and who doesn’t want a fan in the role? When he wasn’t cast as Peeta, he send out a “cryptic” photo on Twitter of bread, thanking fans for their support. (Awww!) Secondly, he’s 25, so the right age, and he has a look that makes us believe he would be very “popular” as a Victor. He can also play tough, yet have a vulnerable side as well, which fits in with what we see both in ‘Catching Fire’ and ‘Mockingjay’. So, we definitely think he could handle the character’s development over the course of the films. Honestly, one of the possible downsides we see is not a “big deal,” but for some we know it could be, and that is simply Hunter is approximately the same height as both Josh and Jennifer. So if he needs to carry Mags and Peeta…well, yes, that could be difficult to envision, but that could be altered as well in some way. So overall, Hunter as Finnick? We’ll sign on for that. I have nothing but crazy, unadulterated love for Hunter Parrish. He’s one of those actors that can do no wrong in my eyes. In addition to be insanely talented he strikes me as a genuinely nice guy. And while I think he has a lot of the emotional characteristics for Finnick Odair there is simply one thing I cannot overlook. (Hunter, if you’re reading this please know that I love you and I’m sorry for what I’m about to say). He is too short. That is literally my only argument over why Hunter can’t be Finnick. Silly but totally valid, right? Savanna: I love Hunter Parrish. I really do. I’m only familiar with his stage work, though (Godspell, Spring Awakening, etc.). He’s so beautiful when he sings, in fact, that it always makes me sad to hear that people only know him from Weeds! I was against the idea of Hunter as Peeta since he definitely looks older than 16, but I wouldn’t be too disappointed if he were cast as Finnick. He definitely doesn’t fit MY mental image of Finnick, but he’s a wonderful actor and we could certainly do much worse. My only concerns lie with his physical appearance. At 5’7″, he’s pretty short — the same height as Josh Hutcherson, in fact. And is he universally attractive enough to make all of Panem swoon? Adam adds: I’m not quite a Parrishioner, but I do have a little faith. When the lighting’s right, he looks the part, but will the writing be right for him? Amanda: Hunter Parrish for Finnick? This one is easy for me. The answer is no. Sorry. I LOVED the idea of Hunter as Peeta. He’s got the sort of stocky build I imagined for Peeta and he’s absolutely boy-next-door adorable – attractive in a way that I wouldn’t describe as drop-dead gorgeous. And although he’s 25 years old, he looks boyishly young. Perfect for Peeta, but it’s for those reasons alone that he just doesn’t fit the description of my Finnick. Plus, if he was cast as Finnick, I’m pretty sure I’d just keep seeing him as Peeta throughout the movie. Tanvi: Hunter Parrish has gained a lot of fans in THG fandom back from the Hunter-as-Peeta days. I had loved the idea, but even back then,thought him to be more on the Finnick side. And now that we’re here – yes, I think Hunter can be a good Finnick! He has the surfer looks, has the acting skills – not just Weeds but as Savanna points out, stage shows as well. While I’m personally not familiar with his outside Weeds work, I take the rest of the guys’ word. Now then, although I’m a supporter, I’m not very staunch on the idea after many other actors that I’ve heard of on this feature. It’s only because of the comparison, I think I’m fifty-fifty on the idea of Hunter as Finnick. Lindsay: I’ll admit that I was on the “Hunter is Peeta” boat. I’m a big fan of Hunter on Weeds, but he has shown his acting chops in multiple shows on Broadway as well (he can sing!). He has the boy next door look and he appears to be about the nicest guy ever in real life. Now, he’s beautiful to look at and he’s got a good body, both of which are important for Finnick. In addition, he seems like he could pull off snarky, flirty Finnick, with a hidden layer of depth. And that’s more important to me than what he looks like. Hunter could be Finnick for me,but I am not positive how much of that doesn’t come from my wish for him to have scored the role of Peeta in the beginning. Either way, if hegets the part, he’ll show the original naysayers that he’s got what it takes to make it in the Hunger Games series. So, what do you think of Hunter Parrish as Finnick in Catching Fire? Let us know in the comments. Want to check out the actors featured previously for Finding Finnick? You can check them all out here. Charity Buzz is currently hosting several Hunger Games related auctions that benefit various charitable organizations. Each auction is unique so be sure to click on the links for more information. You and a guest can enjoy lunch with actress Jacqueline Emerson — Foxface of The Hunger Games in Los Angeles, plus take home a signed poster from the movie. Terms: Includes lunch (maximum of 2 hours) for winner and 1 guest with Jacqueline and her chaperone at a Beverly Hills restaurant. Winning bidder and guest subject to security screening. Every effort will be made to schedule this experience at the earliest possible date convenient to both parties, but please note it may take up to 1 year to schedule based on availability. Must be redeemed by May 23, 2013. Cannot be resold or re-auctioned. 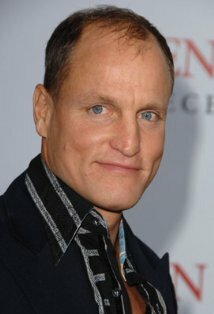 Take this once in a lifetime opportunity to play a game of backgammon with the one and only, Woody Harrelson in Los Angeles. Terms: Valid for one person and one guest to watch the game. Exact location TBD. This is based upon Mr. Harrelson’s availability so the winner must be patient with scheduling process. Cannot be resold or re-auctioned. Expires 1 year from the close of auction. Travel and accommodations are not included. Winning bidder and guest(s) subject to security screening. The biggest fan of Jennifer Lawrence can now own the exact same Elizabeth and James “Scott” jumpsuit she wore on Late Night with Jimmy Fallon to promote Hunger Games, which went on to rule the box office! Terms: In condition as donated. Cannot be returned or exchanged. Cannot be resold or re-auctioned. Additional shipping charges may apply based upon the location of the winner. This package includes a cast signed movie poster and an autographed soft cover book. You’ll also receive four Hunger Games t-shirts, The Hunger Games Tribute Guide, and an unsigned hardcover collector’s edition book. Poster is signed by: Josh Hutcherson, Elizabeth Banks, Liam Helmsworth Jennifer Lawrence, Gary Ross, Woody Harrelson. Book is signed by Elizabeth Banks, Liam Helmsworth, Woody Harrelson, and Jennifer Lawrence. Terms: Poster and soft cover book are signed; other items are unsigned. Note- poster is slightly creased throughout. In condition as donated. Cannot be returned or exchanged. Bid now on 2 tickets to see Lenny Kravitz perform in Italy plus meet the star backstage. Terms: Winner may choose from only 1 of the Italy shows listed above. Cannot be resold or re-auctioned. Travel and accommodations are not included. Winning bidder and guest(s) subject to security screening. EW has our first look at the Collector’s Katniss Everdeen Barbie in the works from Mattel. Desinger Bill Greening, explained to EW why he chose this look rather than the reaping or Capitol looks for the doll. The Hunger Games‘ Katniss Barbie will be available everywhere in August. The Hunger Games Katniss Barbie is now available for pre-order from BarbieCollector.com for $29.95 with a limit of 5 dolls per order. What do you think of the look of the Katniss barbie? This is a “doll”, that is designed more for collecting than play, so will you be pre-ordering one? Let us know in the comments. Are you ‘Hungry for The Hunger Games?’ Well you may literally be after you watch a new series of videos hosted by the Schemestresses on YouTube. In the videos, this talented group of ladies, walk you through the steps to prepare some of the food described in The Hunger Games books. So far there are two videos in the series uploaded with the promise of more to come. Be sure to subscribe to the Schemestresses YouTube Channel so you don’t miss an episode of this tantalizing series. We know Peeta would be proud. And if you want more Hunger Games cooking ideas, check out the Unofficial Hunger Games Cookbook. Video: HD Full Length Hunger Games Trailer! The full length Hunger Games trailer has arrived and it looks amazing! What scenes did you love? What characters did you love? We want to hear your opinions! Youtube version of the Hunger Games trailer.